Starting a soap business is one of those rare home business opportunities that actually can work. 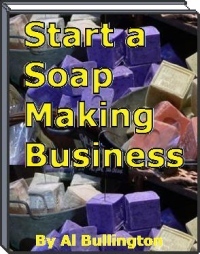 You really can easily start a soap making business and make some extra income. There really is a huge market for natural soaps. Many people like handmade soap and like to buy it from the maker. Commercial soaps are usually drying and many are actually synthetic detergents. Your kitchen crafted soap can work better. It has a special, moisturizing luxury feel. Plus you have the option of customizing it with different ingredients ... especially scents in literally infinite variety. Soap making instructions are everywhere on the Internet. But the instructions are often complicated and hard to follow. This eBook reviews the basics so you can get a picture of the process and better understand some of the instructions you see. Making soap is an easy and fun hobby. Once you start making soap as a hobby, you really have made most of the investment required to start a soap business. But what's the best way to turn soap into money and do it quickly? You can do it for a very small investment and make some money quickly. If you want to make a part-time income from a small scale soap business then read on. • Soap Making Recipe ... Easy and Fast!